NEW BRITAIN - Michael Jessie believes a change in attitude has been the key to his team’s success the past few games. It’s shown on the scoreboard with the Innovation girls basketball team winning their past two games by 20-plus points, including a 51-16 rout of MLC Wednesday night. “The change happened in practice and we’ve been able to carry that over to these past two games,” Jessie, the Ravens head coach, said. 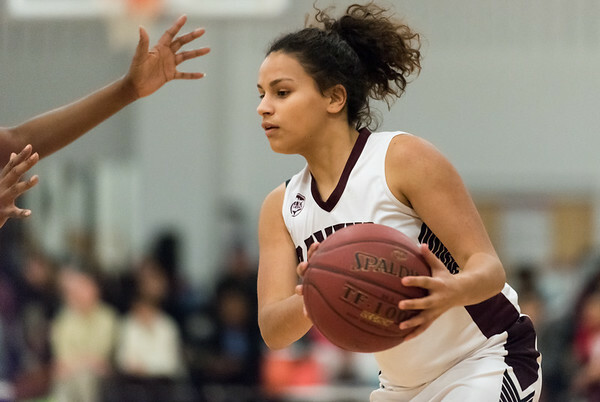 Chelsea Wray-Brown scored a game-high 19 points for Innovation (4-8), while Ariana Rivas finished with five points and seven assists. “She really did a nice of distributing the ball today,” Jessie said. “We’re getting back to our commitment of playing as a team and getting our teammates involved. The Ravens were also strong on the defensive side of the court, keeping MLC to five points over the second half. All five of those points came in the fourth quarter. Innovation 64, MLC 39: Another game and another win for the Ravens. Lenny Okonya and LJ Hazelwood each recorded a double-double to lead Innovation (11-1). Okonya finished with 19 points and 14 rebounds, while Hazelwood scored 12 poitns and pulled down 14 boards. Chael Gillespie and Jaden Walker led MLC with 15 points apiece. But Ravens head coach Matt Lance was rather pleased with his team’s defensive effort, especially in the second half. Hall 88, Southington 82: The Blue Knights dropped their second meet in a row Wednesday to fall to 1-2 on the season. Some notable performances included Tyler Heidgerd, who was a double winner in the 200 freestyle (1:53.02) and 100 backstroke (57.39) as well as Derek Melanson, who took first in the 500 freestyle in a time of 5:18.59. The Blue Knights will next take on Plainville on the road on Friday afternoon. MLC: Jayneisha Howard 1-0-2, Sincere Mickens 1-1-3, Amaya Caez 1-0-2, Sincera Mickens 0-1-1, Dontaijah Vail 1-0-3, Kadasia Riddick 1-0-3, Tori Ford 1-0-2. Totals: 6-2-16. Innovation: Chelsea Wray-Brown 8-2-19, Leeneysha Vargas 0-1-1, Te’ijah Roberts 4-0-10, Ariana Rivas 2-0-5, Brianna Santana 3-0-6, Marleesa May 1-0-2, Lydia Bishop 0-1-1. Annalyees Hill 3-1-7. Totals: 21-5-51. Records: Innovation 4-8, MLC 1-10. Innovation: Armoni Alonso 2-0-4, Lester Emmanuel 4-1-9, LJ Hazelwood 5-2-12, Lenny Okonya 8-2-19, Gabe Matias 2-0-4, Remeish Bogle 4-1-9, C.J. Allen 2-0-4, Julian Figueroa 1-0-3. Totals: 28-6-54. MLC: Chael Gillespie 7-0-15, Jaden Walker 6-0-15, Dallas Hogan 0-3-3, Josh Christopherson 1-0-2, Nathiba Cooper 2-0-4. Totals: 16-3-39. Records: Innovation 11-1, MLC 3-7. Posted in New Britain Herald, Innovation, Southington on Wednesday, 23 January 2019 21:09. Updated: Thursday, 24 January 2019 14:11.